The future is in the hands of society… and new challenges. Moves to different operational locations and continue to work independently. The School of Literacy Education for the Deaf was opened. In 1997, NNC moved to a new location and continued to operate independently. With the assistance of and introductions from the Department of Labor & War Invalids, the Urban Building and Developing Company lent us a building at 100 Phan Boi Chau Street – Quy Nhon – Binh Dinh. We then operated under the name of Nguyen Nga Vocational Training Center with official permission from the Department of Labor & War Invalids. The number of disabled students who came to the Center increased daily. Among them were many deaf students, and this created difficulty for the teachers because they did not know how to communicate with these students. Without hesitation, NNC selected and sent the teachers who were University graduates to a training course for special education skills to teach the deaf before offering them vocational training. 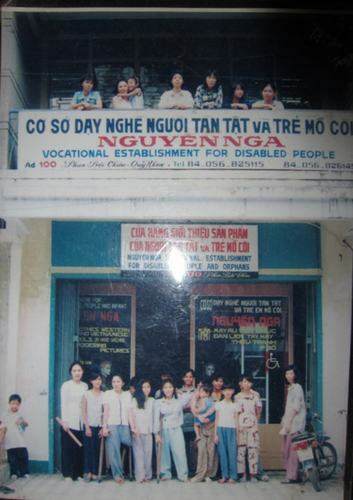 As the result, in 1999 a class for 20 deaf students was opened at 30 Nguyen Van Be Street – Quy Nhon in a building provided by the Urban Building and Developing Company with permission from the Binh Dinh Provincial People’s Committee.